Known for its effortless use and enabling qualities, the Monaco™ has been designed for comfort and mobility with independence at the forefront of its design. The name Monaco comes from the Greek meaning alone or living alone. This is sums up the meaning of the Monaco chair. It was designed to encourage independence in sitting by supporting the body and encouraging the users to stand up independently with little assistance. The Monaco chair provides stability in sitting without compromising function. Early use of the Monaco will reduce dependence on carers for mobilization. 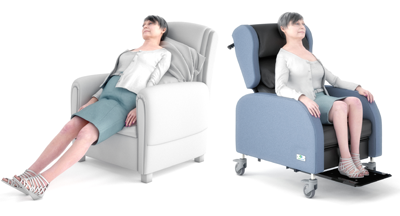 Together with adjustable back recline, waterfall back, optional lateral supports and pressure management materials, a high level of positioning and pressure redistribution is achievable without compromising the function or independence of the user. The Monaco™ accommodates those with tight hamstrings as the negative angle clearance underneath the seat is designed to facilitate safe retraction of the feet behind the knees, ensuring the user’s positioning is not dangerously disrupted. Rachel, 94, had arthritis and a history of falls. She mobilised with a walking frame and needed assistance for transfers. Rachel’s old chair was much too big for her, causing her to slide from the chair. Following assessment it was decided that Rachel should use a Monaco chair. Rachel no longer slid and she was able to easily maintain upright posture. For more in-depth information on all the MONACO™’s features, dimensions and specifications, please feel free to download the operational manual.